The pantry in our new house had very little lighting. My wife wanted some form of light in there, but the pantry wasn’t wired for anything. So, instead of embarking on a traditional wiring project, I decided to try something new. After a tip from Nathan, I decided to try some LED light strips. The light, while not intense, is more than adequate to illuminate the pantry. 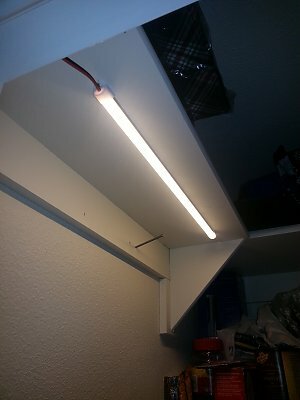 These strips run from 12V, so low-voltage wiring would be adequate. As mentioned above, there is no electricity in the pantry. However, there is a closet adjacent to the pantry that had a switch. 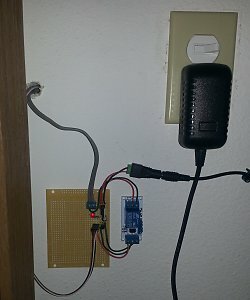 I replaced that switch with a combination switch + outlet, letting me connect a 12V wall wart to power the lighting. 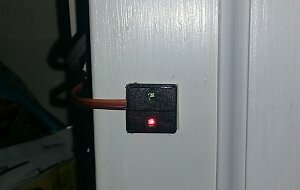 Instead of a lame toggle switch, I decided to take it one step further. 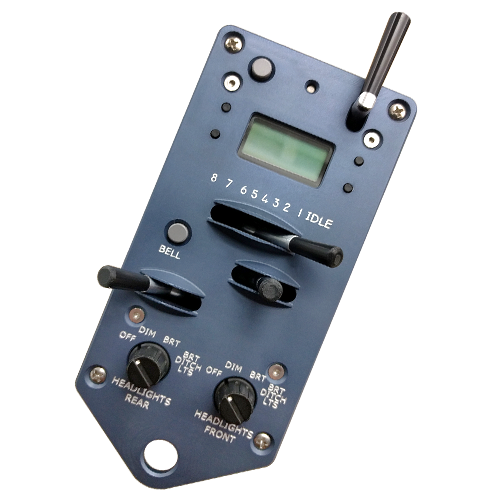 The lights are controlled with a Touch Toggle from Berrett Hill. These are small touch sensors meant as toggle switch replacements. They cannot switch the full current of the LED light, so a relay module and some driver circuitry was added to tie everything together.